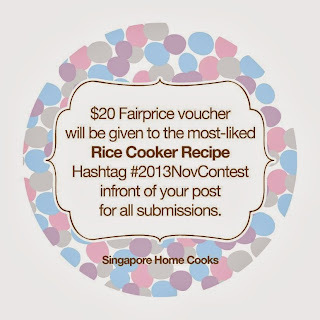 I'm so honoured that my recent Kasutera Cake baked using the rice cooker have inspired the admins of Singapore Home Cooks to start a contest for members to encourage them to make full use of their rice cooker. 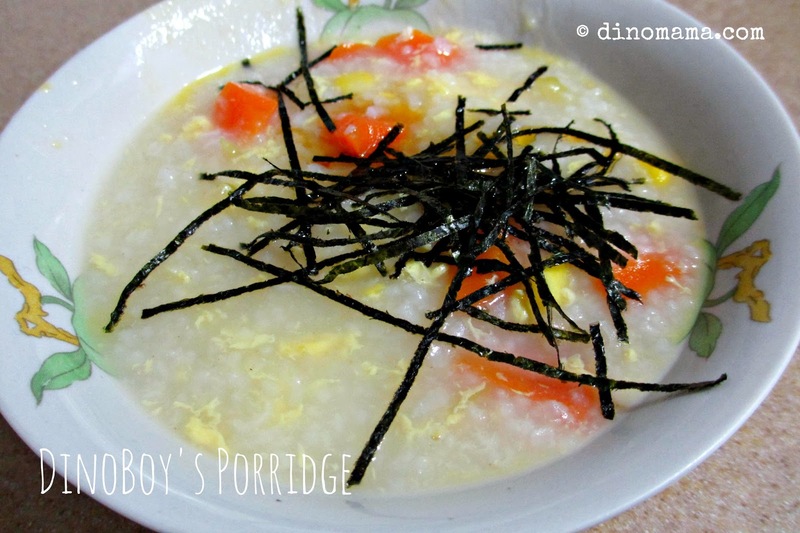 So in support of this contest, I am sharing with all of you my version of a perfect porridge. I am very particular about my porridge, not the watery kind of porridge but the sticky kind which we usually call chok. Thanks to DinoPapa who cooked the most delicious chok a decade ago, since then I feel in love with it and will only home cooked chok. Since chok is also consider a one pot dish/meal, you can basically add in anything that you like. 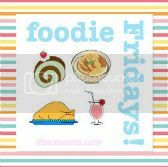 I have added different ingredients including canned peanuts, salted eggs, canned salted vegetable or canned cai xin, pork, chicken, fish, prawns, eggs, preserved beancurd, fishcakes and many more. Its all up to your imagination and your cravings, really. My chok today is a vegetarian version as I decided to cook this at the last minute and couldn't wait for my meat to defrost. 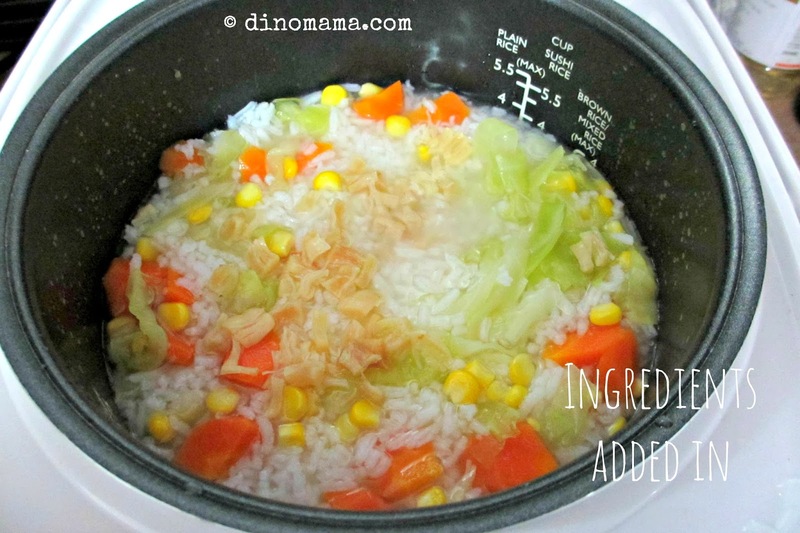 My rice cooker have an "congee" option but I think normal rice cooker will do just good. My chok took about 3 hours to be cooked to perfection, an hour for the rice to be cooked and 2 hours for it to turn sticky and chok-like. I almost faint with hunger because the thought of tasting my delicious chok is too over whelming! Despite the time taken to make the chok, I think I will use this method so that I do not need to stand at the stove, watching the fire and stirring the pot non stop. DinoBoy's chok laced with shredded dried seaweed. 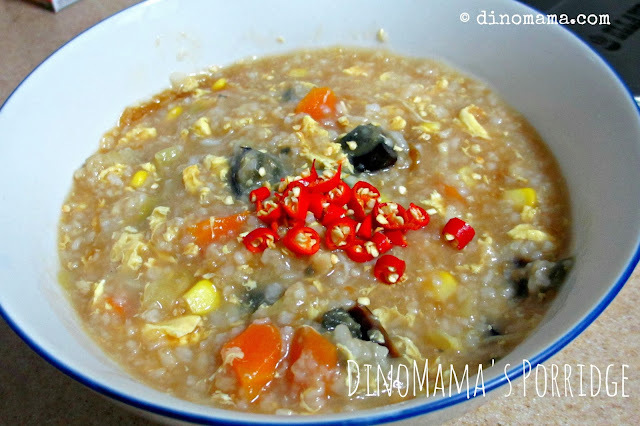 My chok with light soy sauce (don't know why my light soy sauce is so dark), century egg, cut chili padi and dash of pepper. Do you know that besides cooking rice, the rice cooker can be used to cook many other dishes? My rice cooker has a few options, it can cook rice or congee (and something else which I cannot remember) and bake, it also have "quick cook" - the rice will be cooked in about 5mins, and "small portion" - for like half or 1 cup of rice options. The "quick cook" option is very useful as some times I need to prepare meals in lightning speed, I can serve dinner with steaming rice in short period of time. 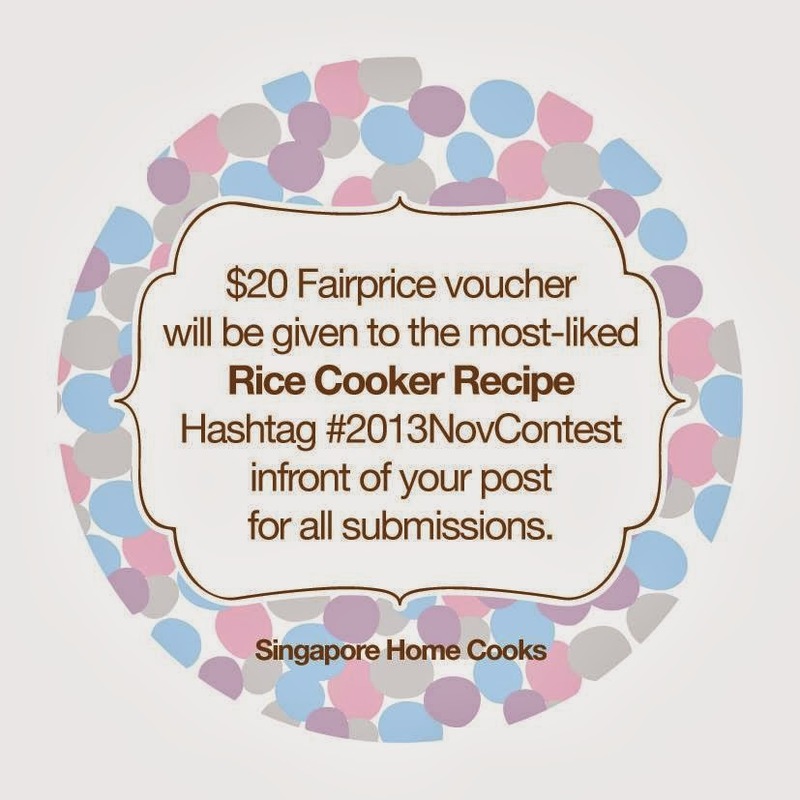 What other functions does your rice cooker have? 2. Cut the cabbage into strips. 3. Cut the carrots into small pieces. 4. 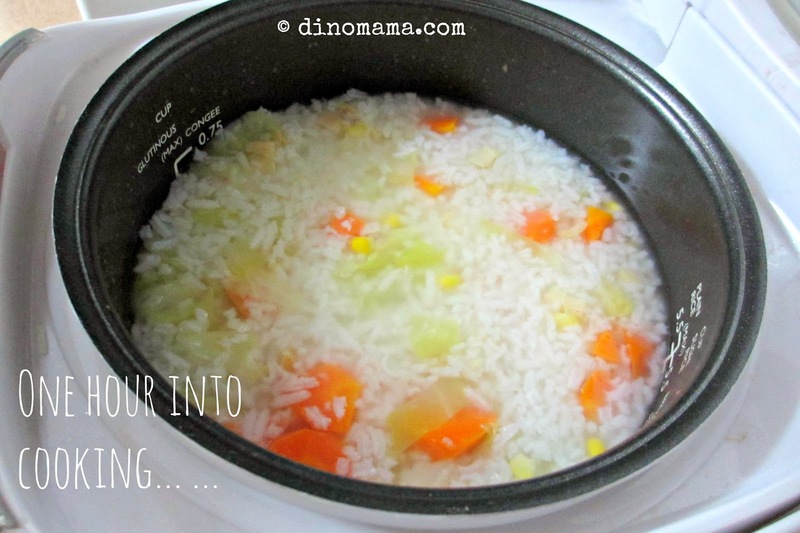 Boil the cabbage and carrots till they are soft. 5. In the meantime, put the rice to cook. 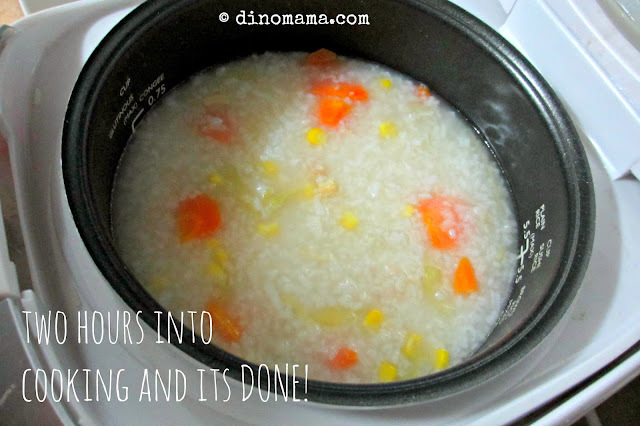 After its done, add a cup of water to it and all the ingredients into the rice cooker pot. Stir to mix them up evenly and cook again. 6. Add in eggs (if desired), a dash of pepper, sesame oil and light soy sauce. 7. Serve while hot but eat it with care unless you want to burnt your lips. Are you swallowing your saliva and craving for chok now? Totally agree with you Serene! I think I'd love this. I've never heard of chok. Is it a Singaporean word? I love cooking. Great post! I found it very useful. Love the final result. Thanks for the inspiration and the tips.